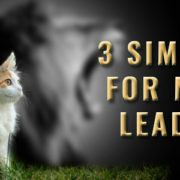 The simple truth is that everyone is a leader but not all leaders are created equal. Leadership is not just restricted to the business world either. It can also be found in people who cook, clean, write, sing, dance, play sports, raise kids, and anything where a choice is required to be made. Every time you make a decision or take an action you are expressing your leadership over your mind and body. This can then be extended to have influence over others if and when the time is right. What’s interesting though is that not everyone believes they are a leader. People who tend to doubt themselves or believe deep down inside that they don’t deserve to happy and fulfilled will often hide in the shadows of their greatness. The motivation here is fear. They are afraid to stand out from the crowd and be noticed. Now, this might sound a little crazy to some of you but when you think about it don’t we all do this to a certain degree? Do you actually know anyone who is living at the top of their game in every area of their life? Sure, some may be killing it in business yet their relationships are a disaster. That’s not good leadership. Great leaders show up in every area of their life equally. They lead from their heart and make decisions based on what they know and intuitively feel. They are not afraid to explore the unknown and work with others for the best possible outcome for the good of all. Most of all, great leaders practice mindfulness. Mindfulness is a great tool to bring to leadership because it helps to improve the way you make decisions. It not only helps you have better creative thought processes it also enhances your ability for clarity, focus, and intuition. Think about those times when you misplaced something and struggled to remember where you left it and the more you strained to recall the less the answer came. Then, when you forgot about it for a moment and stopped trying to remember it flashed into your mind out of nowhere. This is how mindfulness works. It’s simply a way to help clear the mind and be more present. Just by being present the mind stays open and more of your brain power is available to be used. That’s why it’s such a powerful leadership tool because it helps to develop more conscious leaders. Three Tips For Being A More Mindful Leader. 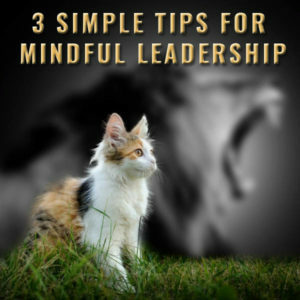 Here are my top 3 tips on how you can use mindfulness to be a more conscious leader. Mindfulness is like any other skill you want to learn – it gets better over time. I’d recommend practicing at least twice a day both in the morning as soon as you get out of bed and in the evening. If you can, allow 20 minutes per session. If that’s not doable, then aim for at least 5 minutes. One of the downfalls for a lot of leaders is that they second guess themselves by listening to their inner critic. By becoming more aware of any limiting or negative self-talk it enables you to catch the mind trying to sabotage your decisions which then gives you the freedom to make more empowered choices. Becoming more mindful of your thoughts and feelings in a non-judgmental way helps you to be more accepting of who you are. Once you learn to accept everything that arises in the mind be it good, bad, or ugly, then you are well on your way to inner peace and joy. Then, you can lead others to do the same.